As president of the Federal Reserve Bank of New York and then as President Barack Obama's secretary of the Treasury, Timothy F. Geithner helped the United States navigate the worst financial crisis since the Great Depression, from boom to bust to rescue to recovery. In a candid, riveting, and historically illuminating memoir, he takes readers behind the scenes of the crisis, explaining the hard choices and politically unpalatable decisions he made to repair a broken financial system and prevent the collapse of the Main Street economy. This is the inside story of how a small group of policy makers--in a thick fog of uncertainty, with unimaginably high stakes--helped avoid a second depression but lost the American people doing it. Stress Test is also a valuable guide to how governments can better manage financial crises, because this one won't be the last. Stress Test reveals a side of Secretary Geithner the public has never seen, starting with his childhood as an American abroad. He recounts his early days as a young Treasury official helping to fight the international financial crises of the 1990s, then describes what he saw, what he did, and what he missed at the New York Fed before the Wall Street boom went bust. He takes readers inside the room as the crisis began, intensified, and burned out of control, discussing the most controversial episodes of his tenures at the New York Fed and the Treasury, including the rescue of Bear Stearns; the harrowing weekend when Lehman Brothers failed; the searing crucible of the AIG rescue as well as the furor over the firm's lavish bonuses; the battles inside the Obama administration over his widely criticized but ultimately successful plan to end the crisis; and the bracing fight for the most sweeping financial reforms in more than seventy years. Secretary Geithner also describes the aftershocks of the crisis, including the administration's efforts to address high unemployment, a series of brutal political battles over deficits and debt, and the drama over Europe's repeated flirtations with the economic abyss. Secretary Geithner is not a politician, but he has things to say about politics--the silliness, the nastiness, the toll it took on his family. But in the end, Stress Test is a hopeful story about public service. 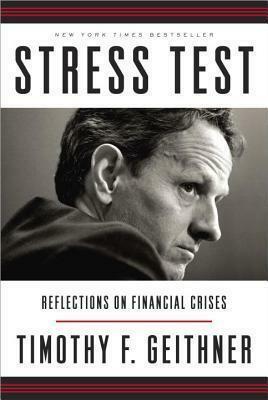 In this revealing memoir, Tim Geithner explains how America withstood the ultimate stress test of its political and financial systems.